Construction has begun on a giant observation tower in the heart of the Amazon basin to monitor climate change. The Amazon Tall Tower Observatory is expected to rise 325m from the ground. Its instruments will gather data on greenhouse gases, aerosol particles and the weather in one of the largest continuous rain forests on the planet. Brazilian and German scientists hope to use the data to better understand sources of greenhouse gases and answer questions on climate change. The tower is being constructed out of steel that was brought thousands of kilometres from the south of Brazil to the site, about 160km (100 miles) from the Amazonian city of Manaus. Because of its height, the tower will make it possible to investigate the alteration and movement of air masses through the forest over a distance of several hundred kilometres. 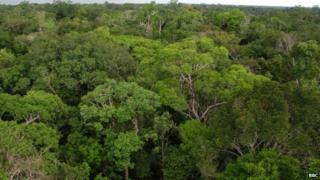 "The measurement point is widely without direct human influence, and therefore ideal to investigate the meaning of the forest region for the chemistry and physics of the atmosphere," said Jurgen Kesselmeier, the project coordinator for the German side, quoted on the Max Planck Institute for Chemistry in Mainz website. The Amazon jungle is one of the world's most sensitive ecosystems, with a powerful influence on the intake and release of carbon into the atmosphere. "The tower will help us answer innumerable questions related to global climate change," said Paulo Artaxo, from the University of Sao Paulo. The tower will be integrated into an existing structure of smaller measuring towers in the region. When finished, it will complement a similar observatory built in 2006 that already stands in Central Siberia.